Tonight’s episode of Legends of Tomorrow concluded a four-way crossover (although not a four episode crossover, like the advertising indicated) between Supergirl, The Flash, Arrow, and Legends of Tomorrow. It was ambitious, it was amazing, it included a lot of characters and sometimes used them well (hi Mick!) and sometimes didn’t (bye Thea!) and, most of all, it had a lot of amazing references to comic books and pop culture. So let’s get this party started. Let’s start with the premise, which comes straight from an actual comic book crossover: Invasion! was a crossover written by Keith Giffen and Bill Mantlo and illustrated by Todd McFarlane in 1989. Like the show’s crossover, it was about the alien Dominators (although here they were allied with a bunch of other races) coming to Earth to destroy all of Earth’s metahumans. In fact, Invasion! introduced the very concept of metahumans to the DC universe. Prior to the crossover, superheroes and villains tended to get their powers through a variety of ways, but the Dominators discovered and isolated the “meta-gene,” which retconned a number of powers to being inherent. So now let’s move on to each individual episode. On The Flash, Harrison “HR” Wells (from Earth-19) still wants to reopen STAR Labs as a museum and wow people with “Particle Vision,” where they can see the Particle Accelerator explosion from the perspective of one of the particles. While this is probably a bad idea (since people probably don’t want to celebrate an event that caused so much destruction and death), HR’s idea of a museum could inevitably lead to the Flash Museum, a staple on the pre-Flashpoint DC Universe. And speaking of Flashpoint, a whole lot of people are angry at Barry for messing with the timeline and causing so many changes. While understandable within the show, this actually brings to mind all of the DC fans who were angry at Barry in the comics for causing Flashpoint since it led to the New 52 reboot. It’s only recently that Barry has been somewhat absolved for his role, since there was an outside force that took away ten years from the world (long story). Barry and his team meet with Oliver and the Legends in a big warehouse in Central City owned by STAR Labs that just happens to look almost exactly like the Hall of Justice. Fun fact: the Hall of Justice first appeared on Super Friends before migrating to the actual comics — the Justice League moved there after their space Watchtower was destroyed. Supergirl comes from Earth-38, a reference to the fact that Superman debuted in Action Comics #1 in 1938. In the actual comics, Earth 38 is home to the characters from Superman and Batman: Generations, a book that takes place in real time (hence Superman showing up in 1938 and Batman a year later). The Dominators brainwash a group of superheroes in order to make them attack Barry and Oliver. While they never outright brainwashed anyone in Invasion!, in the third and final issue, the Dominators did drop a giant Gene Bomb that caused all of the metahumans’ powers to go crazy and forced a number of heroes to fight them in order to stop them from destroying things. The future article about the Flash vanishing in a crisis changes from being written by Iris West-Allen to Julie Greer. Julie Greer was a reporter in the comics who briefly interviewed Jai West (Wally’s son). The basic premise of the episode — Oliver and Company living in a world where he never got onto the Queen’s Gambit and so both parents are alive and he is engaged to Laurel — brings to mind two stories: Alan Moore’s Superman Annual #11, “For the Man Who Has Everything” (where the Black Mercy feeds Superman a dream of a perfect life on Krypton), and the Batman: The Animated Series episode “Perchance to Dream” (where Bruce Wayne wakes up in a world where his parents are alive and he’s engaged to Selina Kyle). In fact, both this episode and “Perchance to Dream” include a scene where Oliver/Bruce suddenly sees someone else as the Hood/Batman. In order to translate some Dominator tech, the Arrow Gang (and Cisco) need to find a device made by Van Horn Industries. In the comics, Andrew Van Horn is Gunfire, a superhero who can, uh, make things explode. Surprisingly, Laura Washington/Cyberwoman is not a character from the comics, although she is likely based on LeTonya Charles/Cyborgirl. Oliver and Company realize something is wrong with their world because of a giant building with “Smoak Industies” on it. Not only was there a Smoak Industries during the “Star City 2046" episode of Legends of Tomorrow, in the comics, the original Felicity Smoak was the head of a tech company. Curtis/Mr Terrific and Rory/Ragman have a conversation about the Divine, which corresponds to their comic book counterparts: Michael Holt/Mr. Terrific is a staunch atheist (even though he lives in the same universe as the Spectre), while Ragman believes that through his good works, the souls of his ancestors are allowed into Heaven. The Dominator’s motives for invading Earth are exactly the same as in the comics: they consider metahumans to be a threat that needs to be eliminated. In the comics, however, they were able to form an alliance of half a dozen different species from the Daxamites (who later switches sides) to the Durlans to the Citadel (which the Omega Men were fighting against) to the Thanagarians. And like the climax to the crossover, the comic book Invasion! also involved a massive bomb that was supposed to kill all metahumans. However, once the Dominators were driven back, they change the Gene Bomb so that it caused metahumans powers to overload...which had the additional irony of causing a bunch of more metahumans to come into existence. Kara calls the whole team “Earth’s Mightiest Heroes,” which is traditionally what the Avengers are called. Of course, the JLA has joined forces with the Avengers before during JLA/Avengers and they went out under the battle cry of “Avengers Assemble!” but that was probably because the JLA doesn’t have a battle cry (the Wasp tried, but all she could come up with was “JLA lambaste!”). 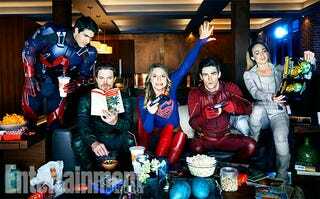 Also, Ray Palmer (Brandon Routh) says that for some reason, Kara Danvers reminds him of his cousin. And that’s all I’ve got. Did you catch any references I missed?